This lesson supports each student’s ability to empathize, connect, and collaborate with a diverse group of peers—skills that are of increasingly important in our multicultural, global society. In this lesson, students will explore their own identities and personal experiences with race, culture, ability, family structure, religion or spirituality, and gender identity and expression. After individual reflection and group discussion, students will create their own identity flowers, filling each petal with words, adjectives, and/or identity terms that describe them. Students will reflect on their own identity in regards to group identities. Students will analyze storybook characters to determine fitting identity terms and adjectives. Students will identify words, adjectives, and identity terms that describe themselves. Students will discuss the importance of respecting people’s identity terms and descriptive words. 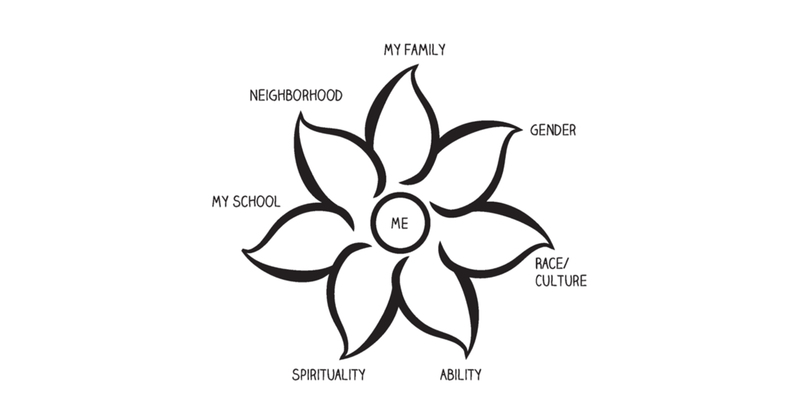 The individual work of creating the Identity Flower handout can be modified for students who need more support by working one-on-one with a teacher and being given stickers or pictures representing the student to place on the sign. Students who need a challenge can be asked to write a paragraph, book, or poem to accompany their Identity Flower handout or asked to compare their identity to the character from their group work.